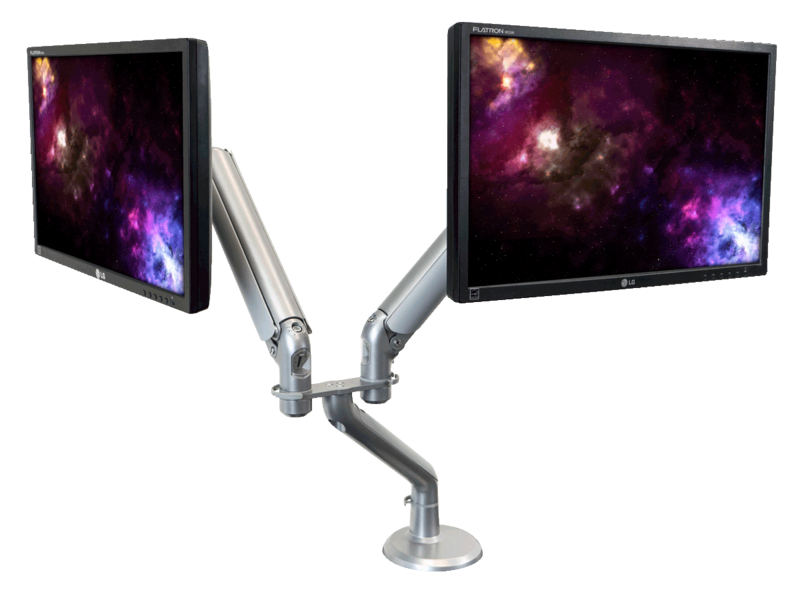 iMovR’s Tempo Dual-Screen Two Arm Monitor Arm lets you independently adjust the position of both monitors to create your perfect ergonomic setup. 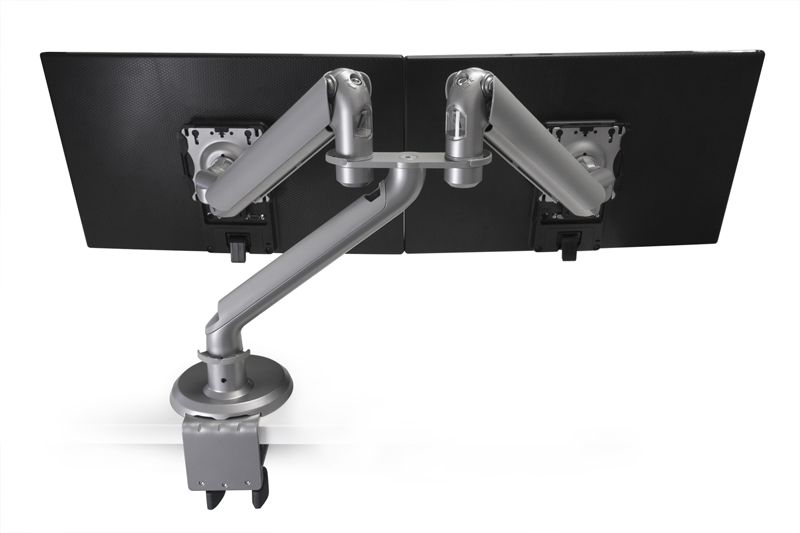 Each Tempo monitor arm offers incredible stability paired with silky-smooth positional adjustment. Weight gauges let you adjust the counterbalance for each monitor, ensuring easy readjustment no matter which configuration you choose. 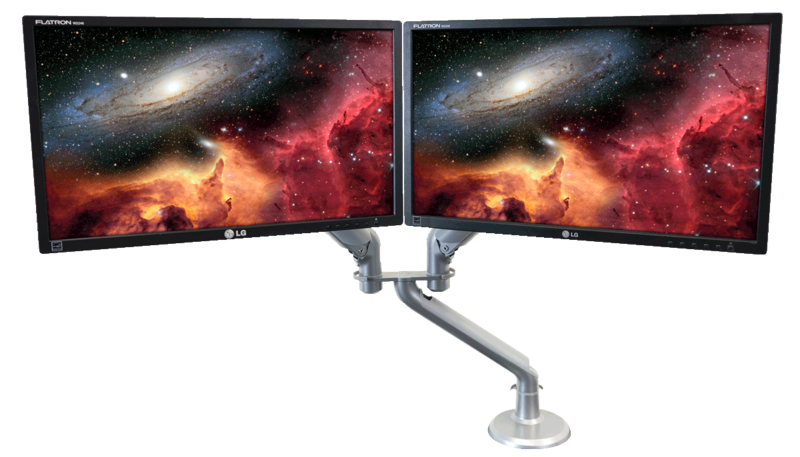 With the Dual-Screen Two Arm's independent monitor positioning, a whole host of configurations become available. Arrange your monitors side-by-side, or stack them up vertically. If you have a touchscreen monitor, you can angle it low or flat while keeping the other upright. You can even share monitors among two workers sitting opposite one another. Just about any configuration option you can think of is at your fingertips. iMovR's Tempo Dual-Screen Two Arm Monitor Arm provides 14.5” of height adjustment, giving you optimal ergonomics for sitting or standing. It can extend outward to an impressive 31.6”, which is especially useful for deeper desks (like corner desks), or retract to a 8.4” depth for maximizing your desktop space. You can also tilt back your touchscreen monitor up to 90 degrees or forward up to 45 degrees—or lower your screen all the way down to the surface of the desk. 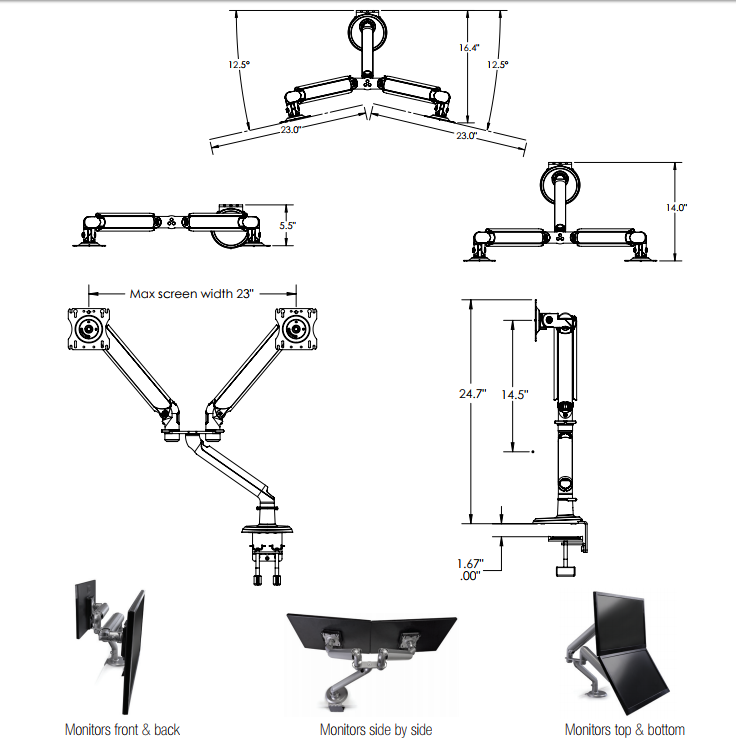 A built-in weight gauge lets you set the counterbalance force with ease—so you can make sure your monitor arm is set to handle the weight of your monitors. The Tempo's counterbalance displays on the gauge and is quickly and easily adjusted using a simple allen key (included). It's much faster than competing monitor arms. Corporate users can identify the perfect weight setting for the office, and set all of their Tempo monitor arms to the same setting with greater efficiency—due to the visible, human-readable weight gauge. The Tempo features standard VESA mounting plates compatible with most monitors. Plate rotates 360 degrees, allowing you to switch between portrait and landscape modes at will.